Grow and share produce with community members. During the spring, summer and fall, The Depot facilitates garden sessions where garden members learn, grow and share in garden maintenance and harvest. These skill-building sessions are open to everyone in the community, including seniors, families, and Depot program participants. Join one of our five collective gardens in NDG and Montreal West. Collective gardens have set schedules where garden members and a facilitator gather to learn ecological gardening techniques, share the work of maintaining the garden, and divide the harvest between garden members. Enter your email address below to receive information about how to sign up for a garden. It is when a whole plot of land is gardened together by a group of people sharing the garden work, the decision making, and the harvest. Garden members choose a garden, as well as their session (1 day and time) and come together throughout the season to garden with their neighbors. Each garden has a facilitator who is there to share gardening knowledge and ensure the sessions run smoothly. As part of the larger urban agriculture movement, collective gardening contributes to food security by increasing access to locally grown produce and increasing community knowledge and connections around healthy food. Who are the gardens for? The gardens are open to any member of the Depot community with priority given to those living within the postal code zones of: ​H4A-H4B-H4V-H4W-H4X-H3X-H3Z-H8R-H3W. The gardens’ objective is to improve access to healthy food, especially for those living on low incomes or who do not have access to land. All levels of knowledge are welcome: no previous gardening experience is necessary. What is included with my garden membership? Gardening: Access to 1 weekly garden session in 1 garden throughout the season; that’s 26 weeks of gardening, plus workshops, events, and garden exchanges. Knowledge and support: The team of facilitators is here to guide you through the garden season. They will share their gardening knowledge, run workshops, and ensure the gardens have what they need to grow great food! Tools, plants, and resources: The Depot supplies the gardens with seeds, seedlings, compost, fertilizers, tools, and many other resources. You do not need to bring additional materials to the garden, only your energy and enthusiasm! Social network: Meet new people, find out about other resources and activities in your community, practice a second language, and learn about other cultures. Harvest: Your membership gives you access to 1 share of food from each garden session you participate in. Last year, garden members took home on average over $150 worth of produce during the season! If you would like additional shares of harvest or would like to join another garden session, we ask you to please pay an additional garden membership fee. What if I cannot afford $40 for my membership contribution? We want to ensure that our programs are accessible to everyone, that is why we have a pay-what-you-can policy for membership amounts. Suggested amounts range from $5, $20, $40, $80, $120, $200 or another amount. Some members request to pay nothing. That’s ok too! The idea is that everyone contributes what they can. If you have questions, please come and talk with us! Can I bring my children to the garden? Yes! Children are welcome at all gardens, however we cannot guarantee childcare during the sessions. If you bring your children to the gardens, you are responsible for their supervision and wellbeing at all times. Please note, it can be difficult to work in the garden if your child is very young or needs constant supervision. We do have 2 garden sessions that offer free babysitting. Please review the garden schedule for more information. Can I bring my partner or other family members to the garden? Yes! The garden is a wonderful place for families to spend time together. Other family members are also welcome, but please note that there is only one share of harvest per membership. How many sessions am I allowed to attend? 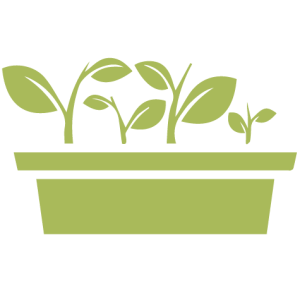 The basic membership allows garden members to attend 1 session in 1 garden per week. If you would like to attend additional sessions we ask you to please pay an additional membership contribution. The season starts in mid-April and goes until late October. Register by May 31st! Are these the same as the Action Communiterre Gardens? Yes! Action Communiterre has merged with The Depot. All their gardens and programs are now part of the Urban Agriculture branch of the The Depot.